dfndr lab’s latest cybersecurity report rounds up the types and sources of attacks that 6.4 potential Android users were exposed to last year. This shows a clear boost in SMS scams which the dfndr lab security team has predicted previously. The types of attacks are interesting, showing an increase in hackers using notifications permissions to spread fraudulent ads, which was number one at 49.8%. 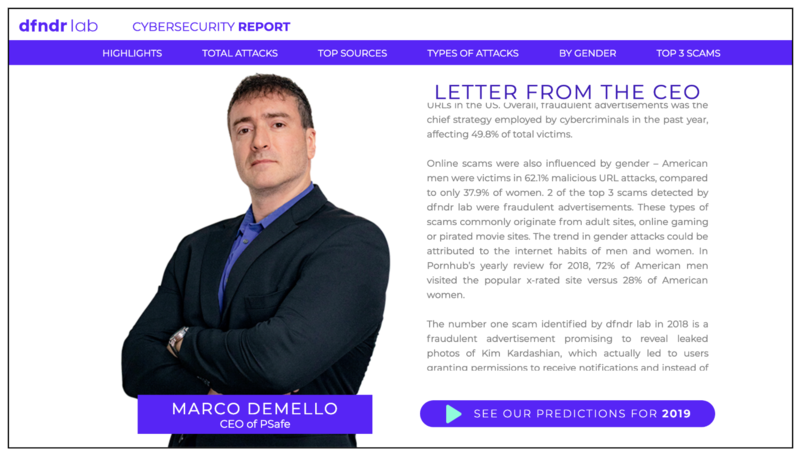 The report also analyzed the top 3 scams of 2018. Leaked Kim Kardashian pictures – the scam promised leaked photos of the reality star but led victims to grant notifications permissions and instead of seeing photos more spam ads appeared. This scam had 893K clicks and shares. Bestadbid advertising pop-ups – a victim encountering this scam may have originated from a gaming site, adult site or a pirated movie site and were asked to grant notifications permissions, which led to more malicious ads. This scam had ‍437.8K clicks and shares. Fake Visa gift card – users were prompted to provide personal information to win a bogus gift card, subsequently putting them at risk for identity theft or a malware attack This scam had ‍437.5K clicks and shares. Men and women have different browsing goals, which can make men more vulnerable to attacks. Your best defence to fight against the ever changing methods of hackers is to download and activate an antivirus app. The dfndr security app is built with proprietary AI technology to anticipate, detect, and block malicious links that appear in your browser, SMS, or messaging apps. Win a Jersey Autographed by a Warriors All-Star!